Being unable to see the wood for the trees is a fairly common idiom, though we could just as easily say we can't see the Milky Way for the stars. Thanks to recent research based on an old astronomy trick, we now have a more accurate idea of where objects are on the other side of the galaxy, filling in key details to the map of our own cosmic backyard. As familiar as the night sky might be, sitting smack bang in the middle of our own galaxy makes it a little harder to get a complete picture of how it looks from the outside. The fact it's a flattened disc doesn't help matters much; the best we can do is find ways to measure the relative positions of stars and plot them on a 3D map. But how do we know how far away a star is? Those twinkling nuclear furnaces come in all manner of sizes and luminosities, so astronomers can't use brightness to determine stellar distances. To make their record-breaking measurement, astronomers from the Max-Planck Institute for Radio Astronomy in Germany and the Harvard-Smithsonian Center for Astrophysics in the US used an astronomy technique that dates back nearly 180 years.Stellar parallax was first used in 1838 by the German astronomer Friedrich Bessel to measure the distance to a star in the constellation Cygnus. His measurement of 10.3 light years was about a light year off; not bad for aguy with a simple telescope, keen eyes, and some sharp trigonometry skills.The basics are fairly straightforward; hold up a forefinger close to your face and close one eye. Then open it, and close the other. Stellar parallax was first used in 1838 by the German astronomer Friedrich Bessel to measure the distance to a star in the constellation Cygnus. His measurement of 10.3 light years was about a light year off; not bad for a guy with a simple telescope, keen eyes, and some sharp trigonometry skills. The basics are fairly straightforward; hold up a forefinger close to your face and close one eye. Then open it, and close the other. Repeat this with your finger held at a distance. The apparent change in your finger's position as you look at it with each eye depends on how far away it is from your face. You'd need your eyes to be pretty far apart to detect the shifts in something as distant as a star. Fortunately as the Earth orbits the Sun, we get just that. A dozen light years away is virtually just over the galactic back fence. To get to see more of the galaxy, we need a telescope with a much sharper focus. Hubble's wide field camera manages a bit better, but even that can only manage to determine the relative shift in a star's position if it's within 10,000 light years. Our galaxy's diameter is estimated to be ten times that size. In this latest analysis, the astronomers were able to measure the distance to a group of stars literally on the other side of the Milky Way, a mind-blowing 66,000 light years away from Earth. This nearly doubles the previous record of just over 36,000 light years achieved in 2013. Both of these distances were measured using a piece of technology called the Very Long Baseline Array (VLBA). In simple terms, the VLBA consists of 10 large antennas separated out over thousands of kilometres between North America, Hawaii, and the Caribbean, making up one single, giant eye. That allows astronomers to detect a shift in a star's position equivalent to the diameter of a baseball on the surface of the Moon. The observations were made several years ago, in 2014 and 2015, detecting light from a region in space where new stars were being born. Surrounding clouds of water and methanol molecules amplified their radiance across the incredible distance, helping them to shine through the thick fog of dust that blocks a lot of the light. "Most of the stars and gas in our galaxy are within this newly-measured distance from the Sun. 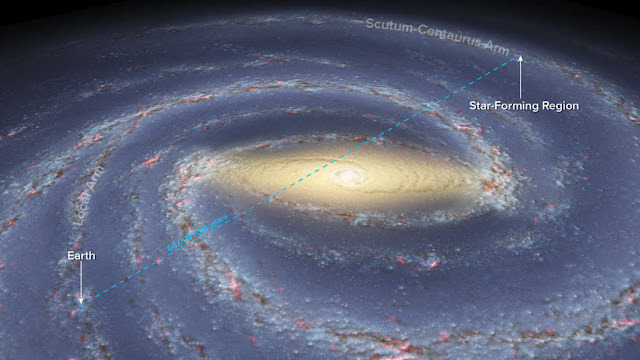 With the VLBA, we now have the capability to measure enough distances to accurately trace the galaxy's spiral arms and learn their true shapes," says researcher Alberto Sanna from the Max-Planck Institute for Radio Astronomy. "This means that, using the VLBA, we now can accurately map the whole extent of our galaxy." We shouldn't hold our breath for an accurate Google Milky Way any time soon – the researchers estimate we're still a decade off having a fairly complete picture. Still, a selfie the size of a galaxy should be well worth the wait. This research was published inScience.